The gut health book that is revolutionizing the way we think about and treat the gut. Work with Dr. Ruscio in person or remotely via phone or Skype. 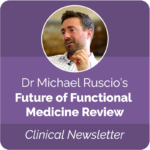 Learn how to practice Dr. Ruscio’s cost-effective and efficacious model of functional medicine. Browse our wide selection of supplements including our popular Elemental Heal liquid diet, probiotics, anti-microbials, and more with free shipping on all domestic orders!